Cities coast to coast are banning, taxing or boycotting traditional single-use plastic straws in an effort to reduce waste and protect the environment. Yet consumers love using straws. What’s an operator to do? There are frequent announcements from foodservice venues making plans to replace traditional plastic straws with alternative options that still allow consumers to conveniently enjoy a beverage. This follows consumers’ growing desire for sustainability – 53% of consumers say it’s important that a restaurant has environmentally friendly practices in place, according to Technomic’s 2017 Value & Pricing Consumer Trend Report. Some consumers want to play an active role in their journey of environmental stewardship by buying reusable straws, but there are drawbacks to using these types of straws. There’s some concern that stainless-steel straws may contain toxic chemicals such as lead. Glass straws add elegance to any dining table, but they’re not safe to use for kids or for travel. Even popular single-use alternatives have drawbacks. Paper straws, for example, often become mushy and collapse. Manufacturers are working hard to make straws that meet both operator and consumer preferences and needs—straws that are functional and help to achieve environmental sustainability goals. Biodegradable straws have the advantage of being cost-effective and performing similarly to traditional straws. 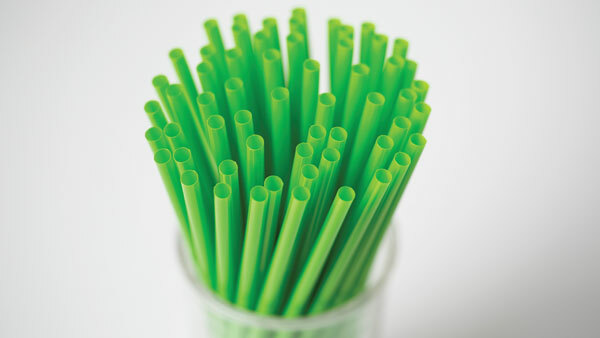 This means that biodegradable straws are not only seen as being environmentally friendly, they’re friendly to an operator’s budget as well. Consumers like using biodegradable straws because it makes them feel that they’re helping to curb waste. According to Technomic’s Value & Pricing report, one-fifth of consumers say that service and amenities at a restaurant contribute to the value of their purchase, and offering biodegradable straws can contribute to that perception of value. Vio® biodegradable* straws by WinCup answer the call for better options. Available in the two most popular sizes—7.75 inches and 10.25 inches—they perform like traditional plastic straws, with the added assurance of biodegrading 88.5% over 7 years*. For more information about the complete line of Vio® biodegradable* straws, stirrers, lids, foam cups and foam containers that help operators and consumers stay committed to their sustainability goals, visit WinCup today. If we’ve learned anything from the current attention on straws, it’s that every decision matters.